Body Flavors was one of the sponsors who provided bloggers some goodies during Blog4Reviews Christmas party last month and I couldn’t be more glad. Aside from my son’s supply of organic VCO soaps running out, it is always a delight for me to try out new organic stuff. Why organic soaps, you ask? I have tried other more commercialized brands especially made for babies but when you check out the ingredients, they contain SLS and other not very friendly chemicals. While they might get its job to clean the body, I have noticed that my son does not remain clean smelling for long. Babies and toddlers are notorious for doning that sour smell (“maasim” in our vernacular) especially when all they do is play. It all came to an end when I switched to organic VCO soaps and shampoo on my kiddo. Although organic soaps usually do not last very long, because of its all natural ingredients, I still choose this over other hyped commercial brands because aside from the guarantee that I’m not introducing anything harmful on my kid’s skin, he smells fresh longer. As I see it, Body Flavors’ market is not exactly targeted solely for babies or kids. The “organic” branding was just the first thing that I got attracted to and that’s just the only thing I use for my son. Hence, my delight. The soaps that are in the goody bag are: Seaweed and Molasses wth Tea Tree, Guava and Orange, Pure Virgin Coconut Oil with Gugo Bark. Seaweed and Molasses with Tea Tree Body Bar (Smoothening and Firming) – Seaweed and molasses gently exfoliates dead skin cells while tea tree oil is reconized as a strong anti-fungal, anti viral and anti-bacterial agent. A combination of seaweed, molasses and tea tree oil used on a regular bais will nourish, enrich and moisturize while it helps tone and lighten your skin. The soap is ideal for cleansing and deodorizing the body. Ingredients: Seaweed, Molasses, Tea Tree oil, VDO and Special Body Flavors organic essences. Guava and Orange Body Bar (Detoxifying and Cleansing) – The decoction of guava is a rich source of natural astringents while orange has antioxidants which will keep your skin glowing and free from aging and wrinkles. This superb blend is a good soap for detoxifying the skin and treating skin problems. Ingredients: Guava, Orange extracts, Premium Coconut Oil and Special Body Flavors organic essences. Pure Virgin Coconut Oil with Gugo Bark Body Soap (Anti-Aging and Moisturizing) – This soap is a rich blend of pure virgin coconut oil and gugo bark which is ideal for sensitive skin. It has a good moisturizing effect restoring a more youthful looking skin. A natural soap for deodorizing the body. Ingredients: Virgin Coconut Oil, Gugo Bark, Sandalwood essential oil and Special Body Flavors organic essences. 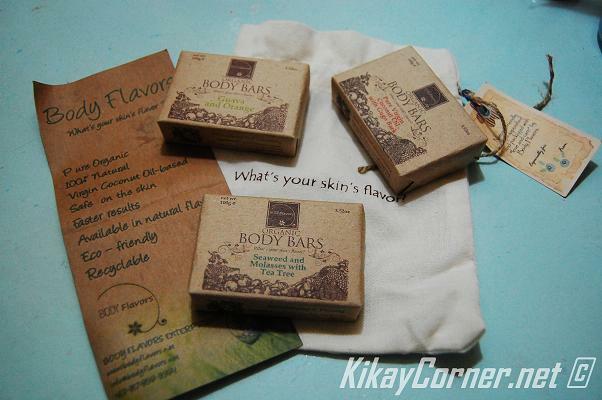 Each soap has 100g net wt, retails for P100 and with packaging that is consistent – they use recycled paper. I still have to review the other two soaps Seaweed & Molasses wth Tea Tree and Guava & Orange. But I am pretty satisfied with the Pure Virgin Coconut Oil with Gugo Bark bar soap.